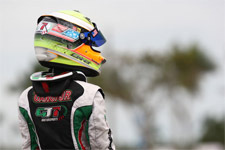 Proving time and time again he is hard to beat, young gun Anthony Gangi Jr. made it four-for-four during his trip to the Homestead Karting Complex for the second stop of the 2013 Formula Kart Productions Florida Winter Tour (FWT). 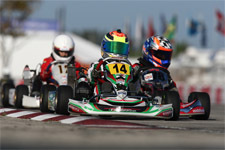 After earning both final victories the weekend prior during in the Vortex TaG Cadet class, Gangi Jr. added two more during the ultra-competitive Rotax event in the Mini Max category. 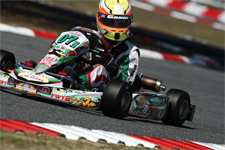 Making that an incredible seven wins out of eight races in 2013 FWT action, the 2012 US Rotax Grand National Mini Max champion continues to prove his prowess in the cadet karting ranks. 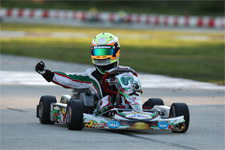 With three feature wins to his credit in the FWT Rotax events, and all four in TaG Cadet, the Brookville, New York resident will look to add more championship titles to his already impressive resume during the series finale in March. Starting off with two qualifying sessions on Friday to start official on track action, Gangi Jr. slightly missed the mark as he clocked ninth quick for Sunday's wheel-to-wheel action. Bettering to fourth fast in the afternoon session, which set the grid for Saturday's events, Gangi Jr. would need to be on his game once the lights went out and racing got underway. Gangi Jr. was able to do just that, as the lighting-quick driver drove a calculated prefinal race on Saturday. Taking the lead by lap eight of 12, the 11-year-old posted fast lap of the race and put himself on pole for the day's feature. Leading every lap of the final, Gangi Jr. was able to take the victory by 1.3 seconds over the field of 37 international pilots. 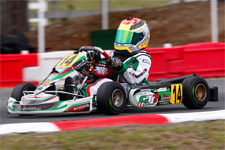 Starting deeper in the field for Sunday's prefinal race, Gangi Jr. used the speed of his GT7/Tony Kart and his racing skill to steadily make his way to the leader. Again earning fast lap honors, the rising star ran out of laps after passing for second on the last lap. A racy battle for the top spot in the final then ensued, with Gangi Jr. edging out his competition for his second victory of the weekend. 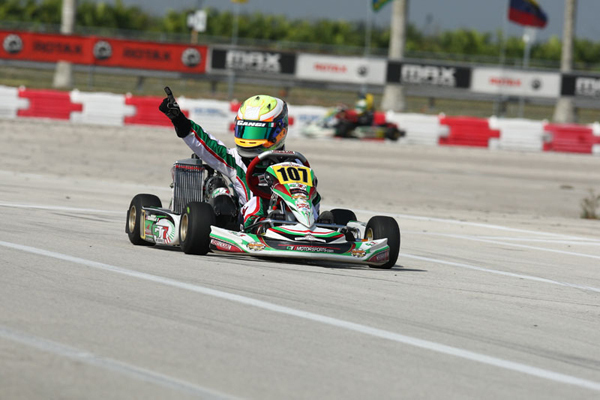 Gangi Jr.'s double victory during the Rotax weekend added up to seven feature wins out of eight races during the 2013 Florida Winter Tour. 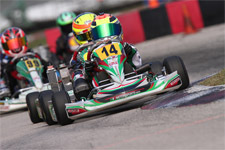 Heading into the finale rounds at the Ocala Gran Prix in March, Gangi Jr. leads the Rotax Mini Max points by 15 markers and holds a sizeable lead in the Vortex TaG Cadet championship standings with a buffer of 376 points. 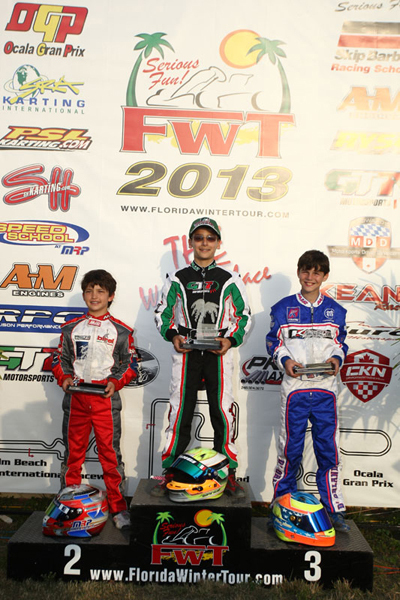 Gangi Jr. will look to become a double 2013 FWT champion when the Tour wraps up March 16-17 for the Formula Kart weekend and March 22-24 for Rotax. Anthony's success would not come without the help of his long time tuner and driving coach Chris Perez and engine builder Daniel Lambert (Disco Dan). Additionally, Gangi Jr. would like to thank Sargeant Motorsports for their continued support along with sponsors Millwork Solutions, Holeshot Drive Systems and PKT Axles.